The Motobu-ryū blog just published an interesting article entitled “Mai no Te and Fluidity.” In it there is a short note mentioning the influence of Western-style military training (heishiki taisō 兵式体操) on the practice of early modern karate. Find corresponding short articles here and also here. In this regard it should be noted that Hanashiro Chōmo’s “Karate Kumite” of 1905 was a document that was exactly built as the Western-style military training manuals of his era. It even used some very specific terminology not found anywhere else. As an example, there is the expression bōfutsu/fusebarai 防拂, or “defensive sweep.” During Hanashiro’s time this was a phrase typically found in the mentioned manuals for western-style military drill. This kind of manuals included didactically prepared descriptions of individual equipment, the commandos, formations, the methods of moving forward and backward, individual and partner exercises, etc. The structure and general fashion of these manuals match with that of Hanashiro’s “Karate Kumite” to a very high level. In addition, at one point Hanashiro refers to the practitioners not as pupils, students, gymnasts or the like. Instead, he explicitly designates the practitioners as senhei 選兵, i.e. the selected soldiers. And this was probably the sole initial meaning and content of school karate at that time: pre-military education. 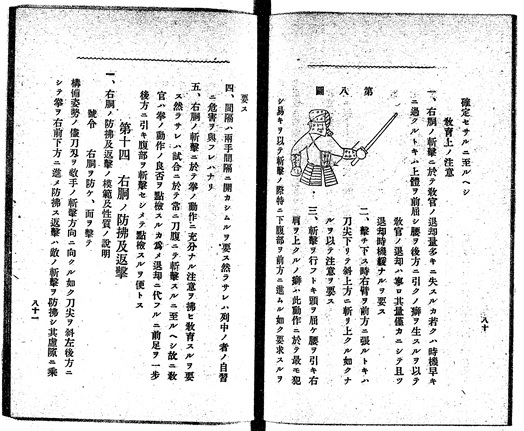 Manual of Western-style military training (heishiki taisō 兵式体操). Since it usually referred to armed methods, Hanashiro’s use of the term “Karate” might originally indeed simply referred to “empty hands,” and not to an age-old indigenous martial art. Kōryoku Sei: Guntōjutsu jikyō Zen. Tsuke – Jōba Guntō-jutsu (The Complete Instructions in the Art of the Military Sword/Sidearm/Bayonet. Appendix: Horse Riding Military Sword/Sidearm/Bayonet) . Gunju Shōkai, Tōkyō 1910 (Meiji 43) . 紅緑生 著：軍刀術示教　全。『附乗馬軍刀術』。軍需商会、明治43年 (1910). Gunju Shōkai Hensan-bu: Tenpan-rei Kenkyū no Shiori. Dai San Shū. (Guide to the Study of Standard Orders. Collection 3) . Gunju Shōkai, (1907-08) . 軍需商会編纂部 著：典範令研究ノ栞。第3集。軍需商会、明治40-41年 (1907-08). This entry was posted in Unknown Ryukyu and tagged Hanashiro Chomo, heishiki taisō, Karate Kumite, Western-style military training, 兵式体操. Bookmark the permalink.